'Western' ('Western Schley') (Nut photo) Seedling selection made by E. E. Risien, San Saba, San Saba County, TX, introduced around 1924. Named in relation to 'Schley', which it resembles in nut shape. Once thought to be a progeny of 'San Saba', but could not be based on genotypes for malate dehydrogenase and leucine aminopeptidase. 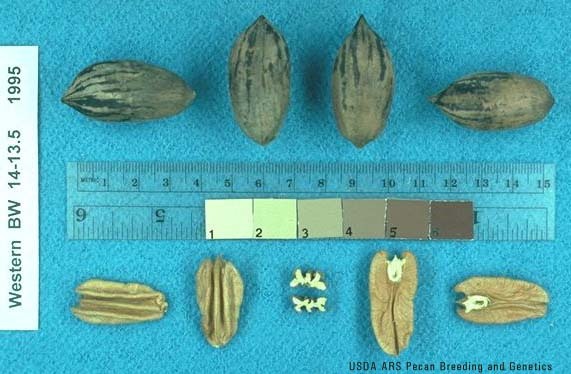 There are more trees of 'Western' than any other cultivar in the western pecan growing region. Nut: oblong elliptic to oblong, with right angled apex and acute base; assymetric; round in cross section; shell surface rough; 57 nuts/lb, 58% kernel; kernels golden to light brown, with deep, tight dorsal grooves that trap packing material and cause kernels to break during shelling. Very susceptible to scab and downy spot. Recommended (1990) for planting in AZ, CA, NM, OK and west TX.